Do I Have Hard Water and Is It a Problem? A) You might and B) it is. Hard water is actually a very common problem here in Florida, and in many areas of the US. It is also a fairly serious problem. No, it’s not going to make you sick the way that water contaminated with biological pollutants will. However, because so few homeowners seem to realize how problematic hard water is, it is often given the time necessary to cause issues. When you need an Orlando, FL plumber to help you out of your hard water fix, we’re the professionals to call. Today, we’ve put together a brief primer on what hard water is, and what types of problems it can cause. Look out for such issue in your home, and contact us with any concerns that you may have. Hard water is not ice—well, not in the way that we mean it when we use the phrase. Instead, hard water is simply water that has too high of a concentration of minerals. Typically, we’re talking about magnesium and calcium. Of course, we’ve just told you that hard water is not going to make you sick, and in most cases, it is not going to cause much of a bad taste—and even if that was a concern, you’ve got a filtration jug for that purpose, right? Well, the fact is that there are a lot more problems than the tase of your water to consider here. And, while we’re on the subject, remember that it’s not just your drinking water that is affected. So what types of problems can you expect to see? Ugly mineral deposits on plumbing fixtures. Feeling unclean even after showering due to soap and shampoo residue. Dingy looking clothes, even right after washing. Potential plumbing problems due to buildup within pipes restricting water flow. If you’re looking to resolve problems with hard water, then using a whole-house water softener is definitely the way to go. Is it worth the hassle? You better believe it. Why? Well, largely due to the fact that using a whole-house water softener isn’t a hassle at all? You’ll need to refill the brine tank with the right kind of softening salt as necessary, but aside from that, the system is totally autonomous. 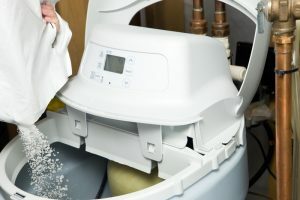 By swapping out the minerals that cause hard water for sodium ions, and then flushing out the tank to remove those minerals from your home entirely, the water softener is able to an effective job of improving your water quality without the need for interference on your part. Like any other whole-house water quality system, of course, your whole-house water softener does need to be installed and serviced by skilled, trained professionals. Contact a member of our team to guarantee that this is the case. Our goal is your complete satisfaction and the protection of your plumbing system, so don’t hesitate to reach out with any questions that you may have. Schedule your plumbing services with Bayonet Plumbing, Heating & Air Conditioning.